The first book in this planned series is set to debut tomorrow, and I’m thrilled to give you a preview of what to expect. First off, if you have no idea what a dime museum is, I didn’t either. Dime museums were popular in the 1800’s and a one of the more popular ones was in New York City, started by the legendary P.T. Barnum. They were home for freak shows, curiosities, and circus performers. Dime museums popped up in many eastern U.S. cities. The setting for THE SHRUNKEN HEAD is 1930’s New York at the mysterious Dumfrey’s Dime Museum of Freaks, Oddities, and Wonders! Most kids here in the western U.S. have no interest in 1930’s New York, but that minor concern will disappear once they discover what’s inside the doors of the museum. The action centers around four orphans with unusual abilities: A contortionist, a mind reader, a knife thrower, and a boy with strength beyond his years. When Mr. Dunfrey’s prized possession, a shrunken head, disappears, the four children set out to solve the mystery. What ensues is murder and mayhem. Both funny and fast paced, this series is sure to attract readers of all ages, not just MG. I for one became an instant fan. 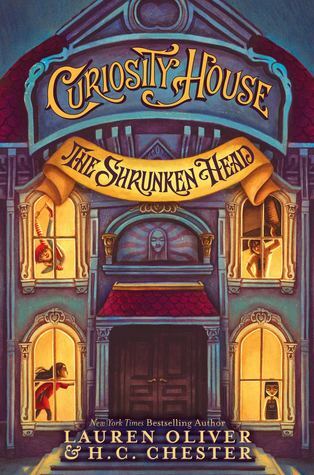 Comment below and win a brand new hard back copy of CURIOSITY HOUSE – THE SHRUNKEN HEAD, courtesy of Harper Collins Publishers. The cover in the image doesn’t do it justice. The actual cover is shiny and gorgeous. You have until October 4th, 7 p.m. EDT to enter. I’ll announce the winner on this blog next Monday. The personalities of the four children are like very different puzzle pieces that end up fitting together nicely. Readers for sure will have a favorite to remember. The mystery angle was a fun one to follow. I had it pretty well figured out by the end but the ride getting there was a scream. You’ll be left hanging at the end, but not too bad. Most of the plot points and secrets are revealed. There’s just enough left to anxiously await book #2 in the series. The creepy underworld of New York City was actually a nice change of pace from most MG books. I hope we learn more about this setting as the trilogy continues. Full page sketches of the many weird things going on are scattered throughout the book. It’s a window to this unique time period. He was wearing the most hideous outfit Max had ever seen: vivid green trousers and scuffled brown shoes paired with an orange-checked shirt that clashed horrendously with his hair. If his clothing could speak, Max knew it would be screaming. How would you describe our book in 15 words or less? For more insights see Lauren Oliver’s web site. Final tidbit: H.C. Chester is also the alter ego of Harold Schechter, renowned true crime writer and professor of American literature and popular culture at Queens College. And he’s Lauren Oliver’s father. The father-daughter writing team combined their talents – Harold Schechter’s vast knowledge from studying crimes and murders and a lifetime of collecting weird and bizarre artifacts, with Lauren Oliver’s skill at writing compelling and relatable stories for young readers. 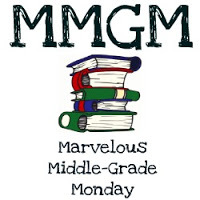 This entry was posted in Reviews and tagged Curiosity House: The Shrunken Head, H.C. Chester, Lauren Oliver, Marvelous Middle Grade Monday, MG book reviews, Middle grade. Bookmark the permalink. Sounds like an interesting read, especially with the New York setting in the 1930’s. This sounds like a great find, Greg. The cover looks bril too. I’ve never heard of dime museums…. but they sound like something Ray Bradbury would write into a one of his novels. Sounds like an interesting book – with a bit of history behind it. Well, a shrunken head would definitely make me curious. I love books like this, all creepy mystery and adventure. It is so me! What’s that say about my MGism??? And surprisingly, I had heard of dime museums before. Go figure. Hey – I like brussels sprouts! I like the cover design, and I can imagine what it looks like glossy. Great concept, too. Dime store orphans solving mysteries. Can’t wait to read it! I’m a huge fan of Lauren Oliver’s other books (especially LIESEL & PO and THE SPINDLERS, and also some of her YA) but I didn’t know she’d teamed up with her father for this one. How interesting! I would love to read this. Thanks for the opportunity. I’d heard of Lauren Oliver but never had the opportunity to read her other works. I must do so now. I am salivating to read this one. Didn’t know it was a father-daughter combo, but think that is great. I would dearly love to win a copy–thanks for the review and the opportunity. What a unique cast of characters this book has! There’s an awesome museum in SF on the wharf that reminds me of the setting for this book. And what a great find for my hard to please guy readers! I’m definitely buying this one to donate! I love every thing you’ve shared about this–from beginning to end! I think it’s destined to land on my shelf…one way or another. 🙂 Thanks for the recommend, I hadn’t heard about it! I’ve never heard of dime museums, but I have heard how great this book is and would just love to read it. Nice review of the book.